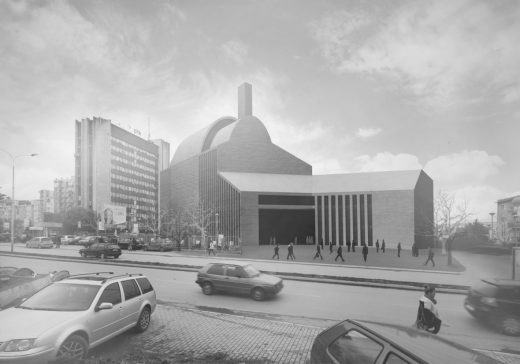 The proposal deploys the most fundamental principle of the Islamic tradition, namely the sense of unity, to create a new city-level place of worship that is flexible enough to accommodate daily users and large Friday congregation. The form of the complex evolved from overlap of the building setback line facing the street and alignment of the prayer hall’s main wall facing Mecca. This has resulted in the creation of a sunken garden between the prayer hall and the street.. The prayer hall and the accompanying annex volume – housing cultural and educational activities open up to a plaza with a symbolic minaret. Set on a plinth raised 4 meters from the ground level on northern and western sides the plaza can be accessed directly from the main street on the western side. The plinth houses shops and parking garage. The exterior does not reveal the size of interior spaces that open up slowly. The interior layout allows for flexible use of spaces without altering the spatial experience. The main worship space can accommodate up to 4000 people, 2500 men and 1500 women, performing their daily prayers. Location of the plaza at the same level facilitates expansion of its capacity up to a maximum of 6000 during certain religious events. Each gender has its own prayer space accessible directly from the street level. The women go directly to the second level the men enter from the plaza level. The ablution space and the prayer area are separated to ensure that there is no humidity transfer. The double-hull fenestration system, comprising of metal screens and the vertical glass surfaces act as a thermal barrier between the building inside and outside. It will also serve as an acoustic buffer between the prayer hall and the street. Red pigmented exposed concrete defines both interior and exterior facades. The complex aims to resonate the building features of Balkan region – plain asymmetrically disposed cubic volumes built of stone masonry, with pitched roofs.